Walking for daily exercise is low-impact, safe and free. It can also improve cardiovascular fitness and strengthen muscles and bones. Physical Activity Guidelines for Older Adults (65+) recommends accumulating at least 150 minutes of physical activity per week to achieve health benefits and improve functional abilities. Choose a familiar route that is flat and free of obstacles. Consider the surface you’ll be walking on. A smooth, soft surface that’s free of debris will put less strain on your joints and feet. Wear supportive footwear – wear low-heeled footwear with non-skid soles. Avoid rushing – rushing increases your risk of falling. Take you time. If using a walking aid (e.g. 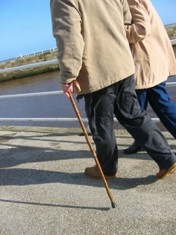 cane or walker) ensure that it is fitted for your height. Be extra careful in cold weather — sidewalks and paths can be slippery. Cold weather can cause numbness and make it difficult for you to feel any pain or an injury. When it’s cold outside, consider walking in an indoor place, like a mall or community fitness centre. Walk with friends or a walking club. Carry a cell phone in case of emergencies. Dress appropriately for the weather and drink plenty of water. Stop or take a break if you feel any pain during your walk. Consult a health care provider if pain continues after your walk.